In recent years, the definition of literacy has evolved to include not only print materials, but visual sign systems and symbols that are easily represented with technology (Harris & Hodges, 1995; Leu & Kinzer, 1999; Valmont, 2003). With this changing definition of literacy comes the challenge of teaching literacy using technology as a tool for student engagement and meaningful learning. As preservice teachers take literacy methods courses, it seems essential that they have experiences using technology for content knowledge development and for application to school settings. This article describes and illustrates how three instructors infuse technology throughout an intermediate literacy methods course. Schmidt, D.A., Merkley, D.J. & Fuhler, C.J. (2004). Integrating Technology Into an Intermediate Literacy Methods Course. 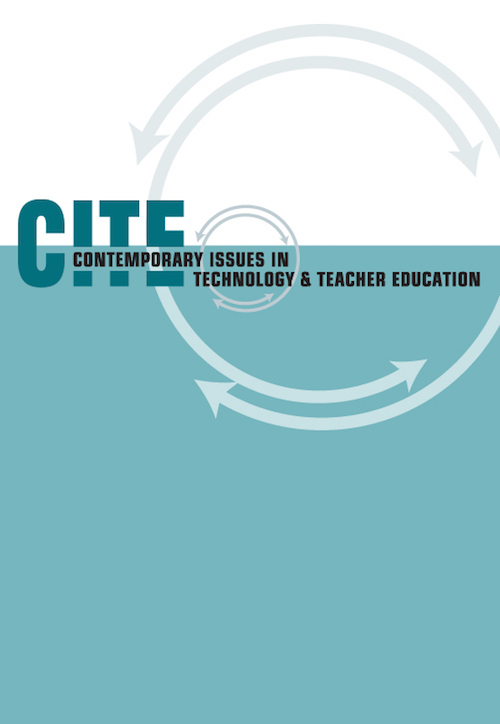 Contemporary Issues in Technology and Teacher Education, 3 (4), 443-452. Waynesville, NC USA: Society for Information Technology & Teacher Education. Retrieved April 24, 2019 from https://www.learntechlib.org/primary/p/21921/. Alverman, D. (1991). The discussion web: A graphic aid for learning across the curriculum. The Reading Teacher, 45 (2), 92-99. Cambourne, B. (2001). Conditions for literacy learning. The Reading Teacher, 54, 784-786. DiCamillo, K. (2000). Because of Winn-Dixie. New York: Scholastic. Farris, P.J., Fuhler, C.J., & Walther, M. (2004). Teaching reading: A balanced approach for today's classrooms. Boston: McGraw-Hill. Glazer, J., & Lamme, L. (1990). Poem picture books and their uses in the classroom. The Reading Teacher, 44(2), 102-109. Grisham, D. (1997). Electronic literacy learning: Teacher's on-line dialogue journals. In C.K. Kinzer, K.A. Hinchman, & D.J. Leu (Eds.). Inquiries in literacy theory and practice (pp. 465-473). Chicago: National Reading Conference. Harris, T.L., & Hodges, R.E. (1995). The literacy dictionary: The vocabulary of reading and writing. Newark, DE: The International Reading Association. Huck, C.S., Hepler, S., Hickman, J., & Kiefer, B.Z. (1997). Children's literature in the elementary school (6th ed.). Madison, WI: Brown& Benchmark. Johnson, D. (1999). Electronic collaboration: Children's literature in the classroom. The Reading Teacher, 53(1), 54-60. Lanier, J. (1992). Virtual reality: The promise of the future. Interactive Learning International, 8(4), 275-279. Leu, D.J., & Kinzer, C.K. (1999). Effective literacy instruction (4th ed). Upper Saddle River, NJ: Prentice Hall. Middleton, T. (1992). Applications of virtual reality to learning. Interactive Learning International. 8(4), 253-257. National Council of Teachers of English and International Reading Association. (1996). Standards for the English language arts. Urbana, IL: Author. Tompkins, G. (2002). Language art (5 th ed.). Upper Saddle River, NJ: Prentice Hall.